Pastor Houpe’s desire is that children come to Christ at an early age, to the life of faith and power. He believes in ministering to the whole child – spirit, soul and body. His vision is to see children educated in a Christian environment with a strong emphasis in academic excellence. 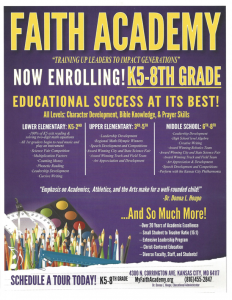 After much prayer and instruction from the Lord, Pastor Houpe was led to start Harvest Christian Schools (HCS) in 1990, now Faith Academy, where Mrs. Donna Houpe is the Educational Administrator.